Here follows my personal reminiscence of Eli Wallach, who died on Tuesday at the age of 98. 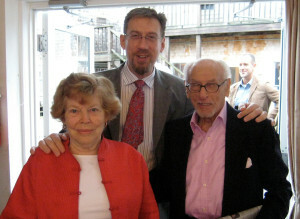 When I met him almost five years ago, Eli Wallach was being held up by two persons who were preparing to usher him toward the exit at the Cathedral of St. John the Divine, where the elderly actor had read with his daughter from Tennessee Williams’ Mister Paradise as part of the ceremonies inducting the dramatist into the cathedral’s Poet’s Corner. For many years, the bulletin board over my desk had a brown and faded copy of a New York Times editorial published just after I arrived in New York City from graduate school. Written by Eli Wallach and his wife Anne Jackson, it concerned their crushed dream of opening a rep company at the South Street Seaport that would offer tickets at affordable prices. It stated that the theatrical establishment would not permit this, since Broadway relied on the half-price booth for its true income, and therefore ticket face value had to remain high, so as to help insure profitable productions. The editorial was basically an apology to New York City for the Wallachs being unable to do what they still felt would have been the right thing. But I had admired Eli Wallach long before I became aware that his heart was in the right place. As a child, my favorite movie was The Good, the Bad, and the Ugly, followed closely by the Magnificent Seven, which I could practically recite from memory, and often did when acting out Wallach’s death scene. It was years later that I recognized the profoundly excellent craft and true artistry that earned him an Honorary Oscar in 2011, and which was demonstrated in films like The Misfits, and Baby Doll. But he was admired even more for his work on the stage, at least by those fortunate enough to have seen him. I never did so, and wasn’t even born when he originated the role I most wished I could have experienced in person. And so, that evening in the cathedral, I strode past the likes of Vanessa Redgrave and Marian Seldes, Olympia Dukakas and Gregory Mosher, to interrupt the progress of the little old man being shuffled out of the way. I apologized for my intrusion, and then asked if he would sign the paperback book I had placed before him. I was unaware he would be there, and just happened to have a copy with me. Wallach looked down with a furrowed brow, which then leapt upwards as he read the title, Camino Real. Produced between The Rose Tattoo and Cat on a Hot Tin Roof, Camino Real was developed at the Actor’s Studio and featured Wallach in the lead role of Kilroy, the all-American boy who does not survive a visit to a corrupt banana republic right out of the Twilight Zone. A surreal dream pageant where the romantic spirit struggles for survival in the age of cold-hearted capitalism, the play was written and premiered on Broadway in the heart of the conventional, conservative 1950s. And being even more ahead of its time than many Williams’ plays, it promptly flopped. And yet, the script contains such poetic beauty, and the ideals of compassion, justice and brotherhood espoused by characters no less than Lord Byron and Don Quixote, and the all-American boy, that I once carried it around for scraps of inspiration in the same way the narrator in Zorba the Greek totes his Dante. And it was directing Camino Real that became my Masters thesis in graduate school. “You got to create Kilroy.” I responded out of reflex. Eli Wallach snapped his head toward me, peered into my eyes with a puzzling look that said, “Who ARE you, and how did you come by all this?” And then a change came over the old actor, as the crow’s feet melted away and he stood more erect with an expression of distinct pride. A gleam came into his eye, and his lips twitched as his mouth searched for words around a flickering tongue, as if he was savoring the tasty memory of being 38 again and starring in his second major Tennessee Williams play on Broadway. “Kazan would Wwwwork it up. And then we would shhhow it to Tennessee…” he said like a master storyteller, to the arc of listeners gathered before him. But just then, two more people pushed through the crowd to put a stop it and take him away. He looked at me with the regret of a child whose play date has been cut short. “I’m sorry. I have to go.” He said to me, as if we were the only two people in the room. And I could tell, he truly wished we could go off together and continue our conversation. I thought about that night, this past Monday, when I was attending a wonderful panel discussion on directing Tennessee Williams, featuring Emily Mann, Austin Pendleton and others, and moderated by Thomas Keith, the Williams scholar and editor, and my friend for nearly 40 decades, who also organized the evening in the cathedral. I had sort of hoped that Eli Wallach would have been in attendance, among those others in the audience who had known the playwright well. I then got word that he had passed away the very next day. “I worked with Eli and his wife Anne Jackson when they wrote a forward to the volume Mister Paradise and Other One-Act Plays. I’ve had the chance to meet many artists of stature, but few have had the natural electricity that Eli Wallach did.” That is how Thomas Keith put it, as we emailed each other with the sad news at just about the same time.